Laminate 101 » What Is Laminate? Today’s laminate floors are available in a multitude of designs, patterns, and textures, yet they all consist of four main components that are bonded together. The bottom layer, or backing, is a melamine plastic layer that lends dimensional stability to the planks and also helps guard against moisture from the sub floor. The next layer is a core board, generally made from high-density fiberboard or particle board, which may also contain melamine plastic resins that help improve the moisture resistance of the core. Then a decorative layer or print film is adhered on top of the core board giving the floor its hardwood or tile look. On top of the other layers is a durable wear layer, providing protection and stain resistance. Many wear layers also contain aluminum oxide, as well as melamine resin, and that creates exceptional durability. All four layers are then combined in a high-pressure process. 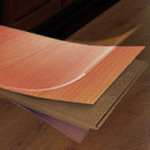 Laminate floors are installed using a “floating floor system” in which a padded underlayment sits between the subfloor and the laminate planks. The planks sit directly on the underlayment and are not anchored to the subfloor on the bottom but rather tongue and groove clicked together at the edges. These floors make for easy repair if that is ever necessary. Next: The Benefits of Laminate?